The reference was to the memoirs of churchman Richard Winter Hamilton LLD, DD, born in London on July 6, 1794. 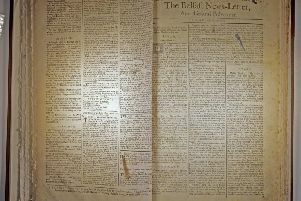 Published in 1850, the thick, 500 page, closely-printed tome recounted Hamilton’s life and work as a preacher, author, traveller and hymn-writer, a hugely productive vocation that began in 1810 when 16-year-old Richard became a theology student at London’s evangelical Hoxton Independent College. Hoxton’s students were required to be “of evangelical sentiments, possessed of good natural abilities” and to have “experienced a divine change”. With all three requirements very much to his credit, and more, Richard was chosen in 1815 as the minister of Albion Independent Chapel, Leeds, and became a popular preacher. His sermons on French Protestants (1816) and the death of the Princess Charlotte (1817) attracted much notice. During his life he was a founder-member and later president of the Leeds Philosophical and Literary Society and author of many books and essays. When Albion Chapel proved too small for his burgeoning congregation the much bigger Belgrave Chapel was built for him nearby and in 1847 he was elected Chairman of the Congregational Union of England and Wales. But it was during his 1828 summer-tour with the Irish branch of the London Missionary Society that he ventured here and wrote his “antiquated description of a visit to the Giant’s Causeway”. At Ballygonny, en route to Cookstown on May 3, he noted “a day of rest…wandered, chatted, lounged, eat, drank, mused, sung, bedded, snored”. Hamilton evidently enjoyed that neighbourhood, because it wasn’t until May 8th that he recorded “this morning we jaunted to Bushmills” where he’d been invited to attend a service at “the Methodist house”. He enjoyed this too – “a most pleasant afternoon and evening and I have only to tell of comfort and religion beneath this friendly and most hospitable roof”. Next day, May 9, which Hamilton had “anticipated with much pleasure and curiosity” he recounted in his diary “we were now within two miles of the Giant’s Causeway. We went down to the shore and were met by our guide. We descended a curious pass and precipice until we scrambled into a cave”. He was enormously impressed with what he saw, like the millions of visitors who’ve come to our world-famous tourist attraction, though, as warned by the local historian who introduced Roamer to his memoirs, Hamilton’s travelogue is distinctly outdated! He described the Causeway as “very majestic. Its echoes when a pistol is discharged are indescribable”. The cave “cannot be entered from the sea, into which it opens. The glimpse of passing vessels is from one point most beautiful. We got out, and very soon were on our way, by boat, to a second cave, which can only be approached by water. We rowed in. The arch is singularly perfect. It is nature’s temple. We then rowed on to a bold headland full of basaltic pillars. We saw the king, and queen, and court – the lion’s head – the chimneys. We landed at the organ. This should always be done, otherwise no one can have an idea of the height and interstices of the columns”. Like most visitors grappling for descriptions of the Causeway Hamilton employed geometry. He left the boat and climbed the rocks for a closer look, noting “the ascent to the organ is sufficiently steep”. He then strode the Causeways’ iconic rocks which he described as “a natural pier of basalts stretching into the sea. I saw two nonagons, one triangle, almost all the rest were pentagonal…it is quite impossible to describe the regularity of these piles”. The rest of his account utilised geometry and geology liberally garnished with theology and philosophy. Hamilton must have regarded his boat trip and rocky ramble with some trepidation because when he got back to Ballygonney he wrote “we returned in safety…good cheer repaired the toils of the day” and added, with a churchman’s eye for detail, “we had a service and collection in the evening”! The next day he visited Dunluce Castle, a trip which will undoubtedly be mentioned on Roamer’s page soon. Richard Winter Hamilton died in Leeds on July 18, 1848.